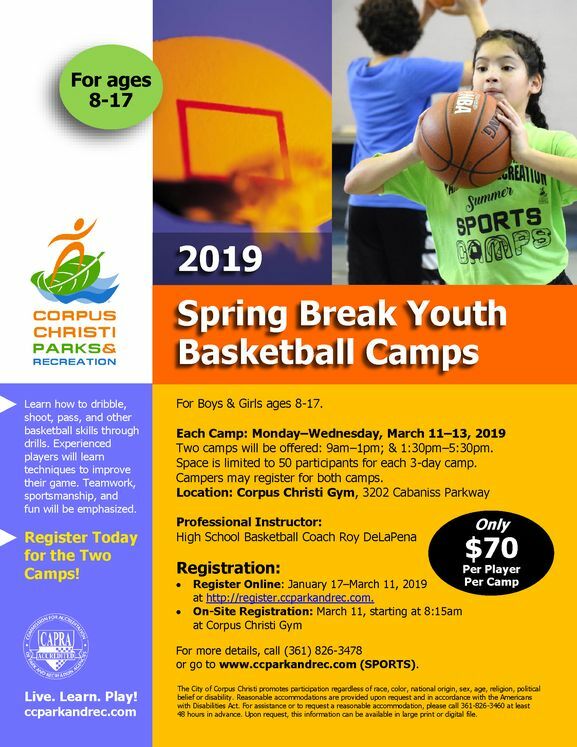 CORPUS CHRISTI, TX – The Corpus Christi Parks & Recreation Department is set to offer its 2019 Spring Break Youth Basketball Camps for boys and girls ages 8-17 at the Corpus Christi Gym, located at 3202 Cabaniss Parkway. The two camps will be offered March 11–13, from 9am–1pm and 1:30pm–5:30pm. Training will include learning the fundamentals of the game using a variety of skills and drills. Frequent basketball games against fellow campers will provide players several opportunities to practice their skills. Local High School Basketball Coach Roy De La Pena will lead the professional instruction for the two camps. REGISTER ONLINE now through Monday, March 11, at www.ccparkandrec.com (click ‘Register Online’). Participants may also register at Corpus Christi Gym on the morning of March 11. Cost for each three-day camp is $70 per camper. Youth may be registered for both camps. Space is limited to 50 participants for each three-day camp. For more information, contact Senior Recreation Leader Daniel Mora at (361) 826-3588 or by email at Danielm3@cctexas.com.